S - 6 Sp Man - Clean CARFAX - No accidents - Fully Serviced - QUALITY CERTIFIED up to 12 Months, 12,000 Miles WARRANTY This MINI includes: CONVENIENCE PKG Keyless Start Automatic Headlights Variable Speed Intermittent Wipers Engine Immobilizer Intermittent Wipers Auto-Dimming Rearview Mirror Universal Garage Door Opener Power Door Locks Keyless Entry Bluetooth Connection Auxiliary Audio Input Rain Sensing Wipers MP3 Player BLACK TOP NAVIGATION SYSTEM Navigation System XENON HEADLIGHTS HID headlights SPORT PKG Tires - Front Performance Aluminum Wheels Traction Control HID headlights Tires - Rear Performance ALL-SEASON TIRES Tires - Front All-Season Tires - Rear All-Season COLD WEATHER PKG Power Mirror(s) Heated Mirrors Heated Front Seat(s) Power Folding Mirrors HEATED EXTERIOR REARVIEW MIRRORS Heated Mirrors CHILI RED 6-SPEED MANUAL GETRAG TRANSMISSION (STD) 6-Speed M/T M/T HEATED FRONT SEATS Heated Front Seat(s) *Note - For third party subscriptions or services, please contact the dealer for more information. * The less money you spend at the pump, the more money you'll have to spend on you. So why not consider this wonderfully styled, fuel-efficient MINI Cooper Hardtop. Exceptional in every sense of the word, this incredibly low mileage vehicle is one of a kind. Put away your phone and focus on the road, your new vehicle has navigation. Know exactly what you're getting when you take home this MINI Cooper Hardtop as past service records are included. Looking for a MINI Cooper Hardtop that is in great condition inside and out? Take a look at this beauty. If you're looking for world-class speed, acceleration, cornering and handling, don't blink because you'll miss this truly amazing automobile. This wonderfully appointed vehicle comes equipped with the options and features every driver craves. Marked by excellent quality and features with unmistakable refined leather interior that added value and class to the MINI Cooper Hardtop The tires on this exceptional vehicle have minimal wear and look to be nearly new. This car enjoys a laser-perfect paint finish. This is your chance to own the very rare MINI Cooper Hardtop. We are proud to offer this 2009 MINI that truly a must-have. 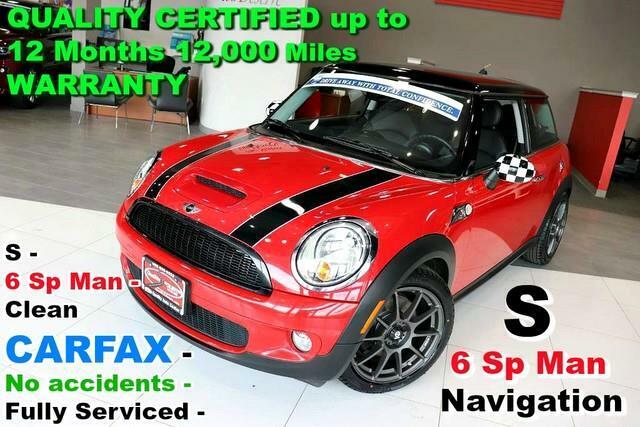 This vehicle's wheels are one of the many attractive features that this Cooper Hardtop S - 6 Sp Man - Clean CARFAX - No accidents - Fully Serviced - QUALITY CERTIFIED up to 12 Months, 12,000 Miles WARRANTY has to offer. More information about the 2009 MINI Cooper Hardtop: The MINI Cooper is one of the most exciting and stylish cars on the market. All models offer fun, agile handling. The base model features excellent fuel economy at 30 mpg city and 37 mpg highway, while the convertible allows for carefree, top-down motoring at the push of a button. The Cooper S brings serious performance to the MINI lineup, and the Clubman adds extra space for sharing the MINI motoring experience with friends. The new John Cooper Works package adds performance tweaks to turn the already go-kart-like MINI into the hottest hatchback on the road. Interesting features of this model are Retro good looks, fuel economy, high performance from both S and John Cooper Works models, and agile handling No Credit / Bad Credit / No Paystubs, No problem !! ! All Approved ! Everyone drives ! CLEAN, GORGEOUS, LOW MILES, SHOWROOM CONDITION. CALL NOW QUALITY CERTIFIED up to 10 YEARS 100,000 MILE WARRANTY , To Certify a vehicle, there will be an additional cost for Certification. CALL NOW For details. STUNNING AGGRESSIVE LOOK ON THIS BEAUTIFUL--Call today to schedule a test drive... Good Credit/Bad Credit/No problem!!!! Get paid cash? No problem!! 100% Credit Approval with interest rates starting at 2.49% for qualified customers, our rates will not be beaten. We price our cars at wholesale price to guarantee the best deals for our customers. Our inventory moves quick, please call to confirm the availability of the vehicle of your interest Springfield location 973-564-0112. This vehicle is located at our SPRINGFIELD location. Come visit our new showroom in Springfield NJ. Check out this gently-used 2009 MINI Cooper Hardtop we recently got in. Start enjoying more time in your new ride and less time at the gas station with this 2009 MINI Cooper Hardtop. The Cooper Hardtop S has been lightly driven and there is little to no wear and tear on this vehicle. The care taken on this gently used vehicle is reflective of the 83,736mi put on this MINI. Just what you've been looking for. With quality in mind, this vehicle is the perfect addition to take home. More information about the 2009 MINI Cooper Hardtop: The MINI Cooper is one of the most exciting and stylish cars on the market. All models offer fun, agile handling. The base model features excellent fuel economy at 30 mpg city and 37 mpg highway, while the convertible allows for carefree, top-down motoring at the push of a button. The Cooper S brings serious performance to the MINI lineup, and the Clubman adds extra space for sharing the MINI motoring experience with friends. The new John Cooper Works package adds performance tweaks to turn the already go-kart-like MINI into the hottest hatchback on the road. This model sets itself apart with Retro good looks, fuel economy, high performance from both S and John Cooper Works models, and agile handling No Credit / Bad Credit / No Paystubs, No problem !! ! All Approved ! Everyone drives ! CLEAN, GORGEOUS, LOW MILES, SHOWROOM CONDITION. CALL NOW QUALITY CERTIFIED up to 10 YEARS 100,000 MILE WARRANTY , To Certify a vehicle, there will be an additional cost for Certification. CALL NOW For details. STUNNING AGGRESSIVE LOOK ON THIS BEAUTIFUL--Call today to schedule a test drive... Good Credit/Bad Credit/No problem!!!! Get paid cash? No problem!! 100% Credit Approval with interest rates starting at 2.49% for qualified customers, our rates will not be beaten. We price our cars at wholesale price to guarantee the best deals for our customers. Our inventory moves quick, please call to confirm the availability of the vehicle of your interest Springfield location 973-564-0112. This vehicle is located at our SPRINGFIELD location. Come visit our new showroom in Springfield NJ.